Forms are types of questionnaires or surveys that are used to gather information for database and reporting purposes. 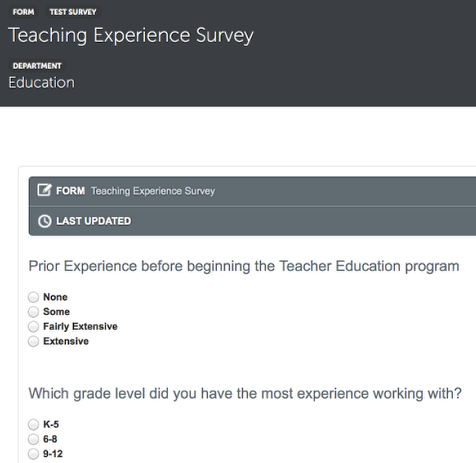 Use forms to create general surveys such as prior experience, attitude and opinion scales (strongly agree to strongly disagree), checklists (required documents, etc. ), and to track field experiences. Forms are distributed at various locations in the application, depending upon the purpose and whom is going to complete the form - please see each form type below to see which form will meet your needs. Forms can be kept hidden until you are ready to release them. Forms can be mandatory, include comment blocks, and can be made non-editable once completed by the user. You can create distribution lists for forms from the Department Contact Lists and/or your personal Contact List. Forms can be attached to rubrics and sent to external assessors or they can be sent out without attaching an instrument. Journal Templates allow for tracking of student field experiences or other logged type of entries. Journal templates can be configured to track dates, work hours, responses to questions/prompts and allow for supervisor sign off. Administrators can easily generate and export summary reports. Journals are accessible to users via the Work menu, where they would select the Journals option. Journals are not linked to Portfolios; They are a separate feature. 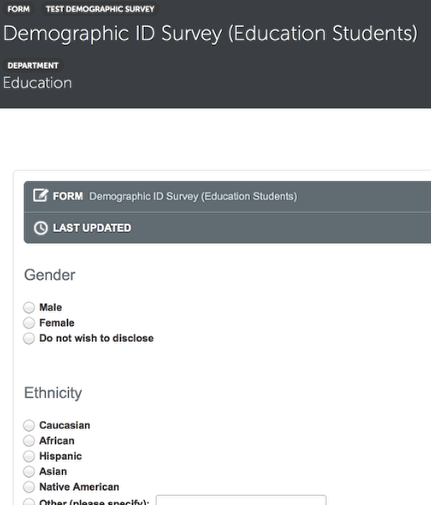 Demographic surveys can be distributed to students or assessors. This type of form uses categories of answers that identify the respondent as a member of a particular group (e.g. gender, ethnicity, age). Add headings and questions to the survey topic. If set to Visible only, the survey will appear under the Surveys tab on your dashboard. It can be completed from the Surveys tab by clicking on the 'take' button associated with the survey. If you would like for the survey to be triggered automatically, set the options to Visible and Required. This will present the form to the users the next time that they submit work for assessment (students) or complete an assessment (assessors). The demographic survey must be completed before the user can complete their submission or their assessment. If you are importing demographic data, instead of having the user complete the form, you should not make the form visible or required. NOTE: If you would like a demographic survey to be presented to assessors when they begin an assessment, the 'Assessor Demographic Surveys' policy must be set to 'Allow'. This policy option is accessible via your System Menu. Select 'Site Settings' and then click on the 'Policies' link. Surveys are used to collect attitudes and opinions. Surveys can be distributed to Students, Assessors, Administrators, and External individuals. Surveys are distributed to the user from the Surveys tab on your Dashboard and can be distributed to users upon submission if desired. 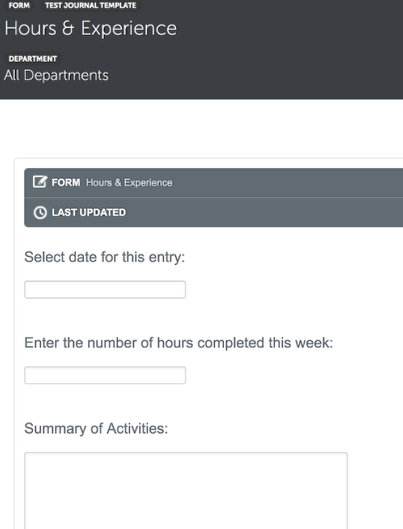 If the 'Prevent Users from Editing Completed Forms' option is not selected on the Form Settings screen, the form can be updated by the user at any time. However, if the 'Prevent Users from Editing Completed Forms' option is selected, the user will not have access to the survey once it has been completed. 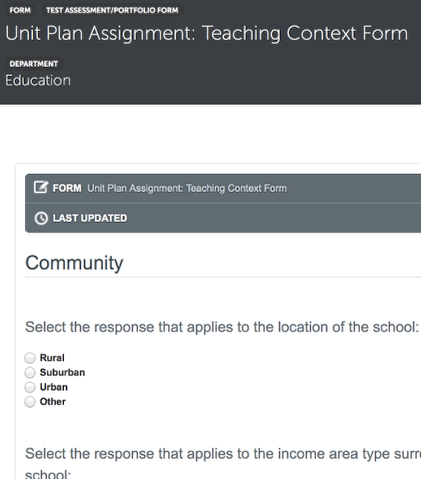 NOTE: If you are creating a form for use with a Field Placement, you MUST use the Survey form type. Course Evaluations can only be distributed to students. 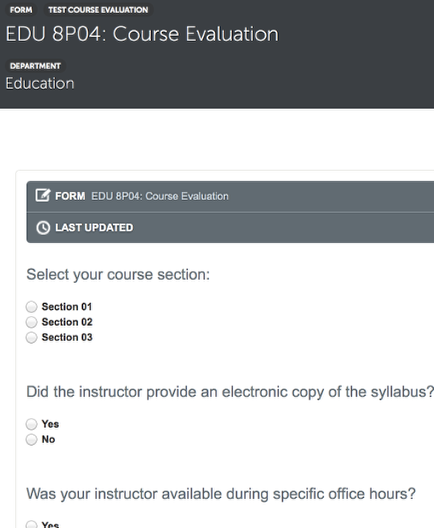 When a student submits work to a rubric associated with a course evaluation form, the system will trigger the distribution of the course evaluation. It will be presented to the student upon their next submission. Course Evaluation responses are anonymous to all users, including Administrators. Assessment/Portfolio forms can be linked to a frame of a Table of Contents section by an administrator or can be attached to a portfolio page by any user for use within a portfolio. Assessment/Portfolio forms can be submitted for assessment using an assessment instrument. Assessment/Portfolio forms remain linked to the portfolio page and can be updated and re-submitted if required. Assessment/Portfolio Forms can also be locked to prevent editing after they are completed the first time. NOTE: Assessment/Portfolio forms must be submitted via a portfolio in order for the response data to be available to administrators for review on the View Form screen and/or for Reporting purposes.